— BugsInTheNews is a VIEWER-PARTICIPANT WEBSITE. This article by Jerry Cates, Marney M. (SHNF), and Cliff M. (San Antonio, TX), was first published in July 2009, and revised last on 8 July 2012. © Bugsinthenews Vol. 10:07. I thanked Marney for the excellent photos, and asked if he could resend them, not as email photo attachments (which some mail servers automatically reduce to a low resolution for email transmission) but as image file attachments (that the mail server will send without modifying). He did that immediately, and enlargements of selected portions of both photographs are posted here, showing important anatomical features not visible on the email attachments initially received. I was struck, on first viewing these, by the similarity these photos bear to a set of images I remember seeing, in the late 1940’s as a young child, in a nature encyclopedia. The encyclopedia, which I recall to have been published in the 1920’s, provided a well-written article on funnel-web weavers, and told of the biology of such spiders, how they build their funnel-web snares, and the mechanics of how they kill and consume their prey. Such accounts, supplied with beautiful drawings and well-illustrated photographs, caused my interest in nature to blossom and grow. Now I wonder if the content of this page, meager as it is, might grip other young minds, with anything similar in way of effect. Willis J. Gertsch, at the time Curator Emeritus, Department of Insects and Spiders, American Museum of Natural History, published in 1979 an excellent book on arachnids, titled “American Spiders”. In this book, Gertsch devoted a total of five pages to the funnel-web weavers. 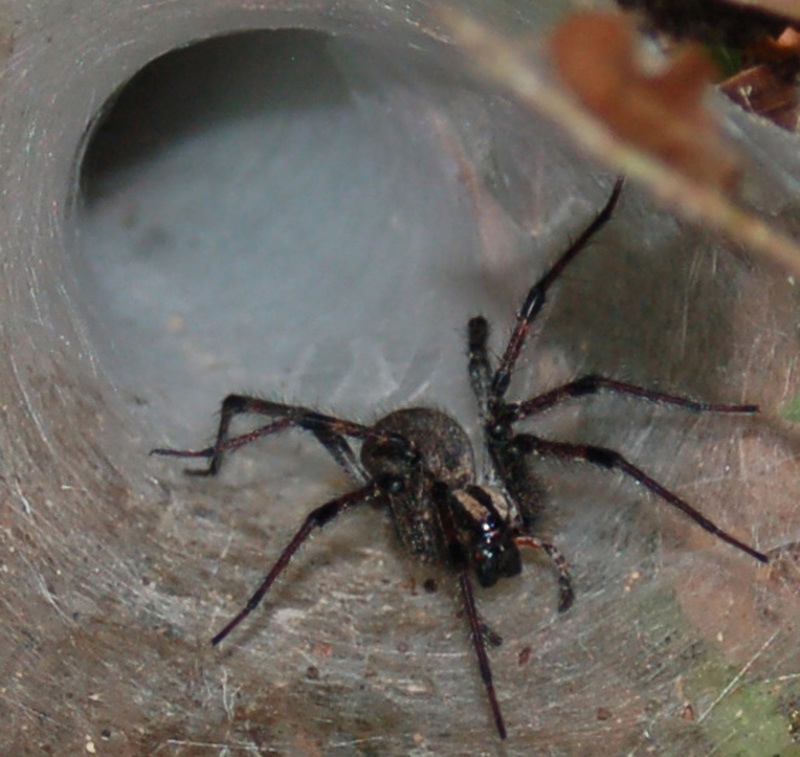 He mentions in those pages that the Agelenidae (which, then as now, was devoted to the funnel-web weavers) comprise a numerous and diverse family of over 400 species found in the United States. Presently, due to a number of important revisions to arachnid taxonomy, the Agelenidae of North America is represented in but 9 genera and 85 species. The Amaurobiidae (10 N.A. genera, 97 species), though once included within the Agelenidae, are now accorded family status on their own, being recognized as mostly builders of cribellate retreats with radiating tangles, and — for an ecribellate subset — sheet webs with one or a plurality of retreats, or small sheet webs that they hang from, inverted. Note that the photos displayed on this page, as with images posted on all web pages on bugsinthenews, may be enlarged for more detailed viewing by hovering your cursor over them, then clicking. It is not possible to assign a specific genus or species from these photos. The crucial anatomical features needed for such assignments are simply not visible. Species in the genus Tegenaria have eight eyes of roughly equal size, though the anterior lateral eyes (ALE) are slightly larger; both eye rows are roughly straight or gently procurved. The remaining eight Agelenidae genera represented in North America also have eight eyes, but their ALE are both dramatically larger and relatively close together, with the much smaller anterior median eyes (AME) immediately above them. In the first photograph posted here, the reflection of Marney’s flash appears to emanate from two large ALE, with another reflection that could be produced by two smaller PLE above and between them. However, it is unwise to infer anything about the respective size of this spider’s eyes from these reflections, as the eyes themselves are not visible in sufficient resolution to allow comparisons to be made between them. The funnel web, in general, is said to be similarly constructed by all species in the Agelenidae. Gertsch described it as having both an entrance and an exit, the latter hidden from view but supplying a propitious back door exit from a nasty situation should the need arise. Spread before the entrance is an expansive sheet web that beguiles naive insects and other organisms who mistake it for a nice place to land, meander across, or to rest upon. The spider, whose tarsi are unencumbered by any structures beyond their three claws, races over the sheet web with facility, capturing the foolish interlopers and producing therefrom a nifty repast. This facility comes with a price, as agelenids — lacking the brush of fine hairs, at the tips of their feet (scopulae, as described in Foelix, 1996, p. 18, 20-21) — cannot scale smooth surfaces such as glass or porcelain the way many other spiders do. Thus cosmopolitan agelenids that invade our homes and businesses often become ensnared by kitchen bowls, porcelain sinks, and bathroom tubs; once they fall into these smooth-sided articles they are unable to climb out. 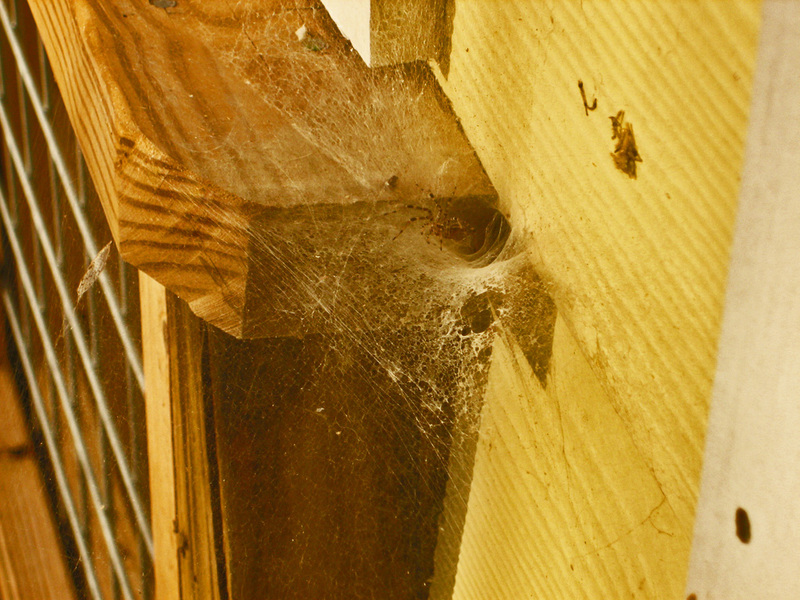 The sheet web gracing the threshold of the funnel retreat is, according to Gertsch, a work of a lifetime for the funnel-web weaver. She constantly adds to the throughout her existence, rather than daily tearing it down and rebuilding from scratch the way most orb-weaving spiders do. I thanked Cliff for the excellent photos, and asked if he could take some more, especially of the frontal head that will show the arrangement of the eyes. Then I explained I was only a few years his junior, and I, too, had kept a camera nearby since my tenth Christmas, when I found a Kodak Hawkeye under the tree with my name on it. Two years later, using money saved from a paper route, I bought an Argus C-3, and have sought to hone my skills at photography ever since. The Argus C-3 was retired years ago, but it is still a beautiful instrument. As to the photo at hand, it is of a funnel web weaver in the family Agelenidae, similar in many respects to the specimen Marney M. photographed at Sam Houston National Forest on July 3rd. Notice, for example, that the patella of each leg is darkened, as is the distal portion of each tibia, and the tarsus of each palp, in both spiders. There are important differences, too. Cliff’s spider’s legs have additional dark bands, for one thing, to the point that every leg segment has a dark mark at its distal end and the tibia is marked at mid-shaft as well. The alternating dark and light stripes on the carapace are reversed, for another; Cliff’s spider has a dark, narrow median stripe bordered on each side by a narrow pale stripe, then by a broad dark stripe. Marney’s spider, however, has a pale median stripe bordered by a broad, dark marking. The science of arachnology is in a dizzying state of flux. Nowhere is that more evident than in the assignment of individual spiders to family, genus, and species. When we speak of a spider as being an agelenid, as we are doing here, one might presume the term to have a well-defined, undisputed meaning. In the main, perhaps, it does. But on delving more deeply, one easily gets the impression that the seemingly rigid walls around that meaning are so riddled with cracks as to require constant remodeling (i.e., revisions). The old saw about broken eggs and omelettes is, methinks, apropos, as the following review illustrates. The family name, Agelenidae, was first described in 1837, some 174 years ago, and derives from the Latin word, agel, for “a small field.” Over the intervening generations, its reach has expanded and shrunk as new spiders were added and old ones were either discarded (on recognizing them as synonyms of existing species), used to create new families or genera, or moved to other, more appropriate taxa. Over that same period, many of the spiders in the family have had their binomial names altered, some gently, others in a more dramatic fashion. Note that one or more investigators misspelled the family name as Agalenidae, and the generic name that derives from it (Agelena) as Agalena. Emerton’s 1902 book, published 19 years after his 1883 book on spiders and their habits, is occupied with describing species, and devotes sixteen pages (pp. 91-106) to the individual Agelenidae (he persists in spelling it Agalenidae). In these pages, he describes, by name, seven separate agelenids (misspelling the generic name as in 1883), omitting attribution: (1) Agalena nævia, the common grass spider mentioned in passing in his 1883 book, (2) Tegeneria derhamii, (3) Tegeneria (Cælotes) medicinalis, (4) Tegenaria (Cælotes) longitarsus, (5) Tegenaria (Cicurina) complicata, (6) Hahnia bimaculata, and (7) Hahnia cinerea. 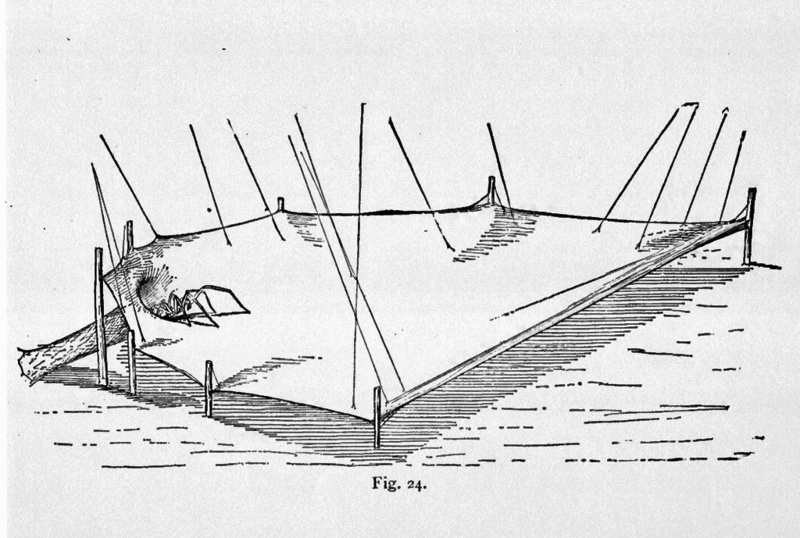 Comstock’s 1912 book on spiders, published 12 years after Emerton, 1902, devotes 17 pages (pp. 582-598) to the Agelenidae (he spells the family and generic names correctly). Though most likely benefitting from Emerton’s previously published works, he makes no direct references to them. In the third paragraph of his exposition he states that the family includes such notables as Argyroneta aquatica¹ of Europe. Then he lists “the nine genera of our fauna,” and discusses each separately, describing one or more species in more detail, usually without attribution: (1) Cybæus giganteus, (2) Agelena nævia, whose male palpal characters are so varied that he wonders if more than one species may be involved, (3) Coras medicinalis, here noting that “Hentz, who first described the species and proposed the name medicinalis for it, states that ‘for some time the use of its web as a narcotic in cases of fever was recommended by many physicians in this country; but now it is probably seldom used. '”²; (4) Tegenaria derhami, here spelled with a single “i” rather than the “ii” used by Emerton, (5) Cœlotes fidelis, (6) Chorizomma californica, (7) Cicurina arcuata, (8) Cryphœca montana Emerton, and Cryphœca peckami, and (9) Hahnia agilis, and Hahnia cinerea. ¹The species Argyroneta aquatica Latrielle, 1804, also known as the diving bell spider, was for many years included in the Agelenidae as a separate genus comprising a single species, but was transferred to the Cybaeinae by Grothendieck & Kraus, in 1994. The Cybaeinae, traditionally considered a subfamily of Agelenidae, was made a subfamily of Dictynidae by Lehtinen in 1967 and elevated to family status by Forster in 1970. Platnick (2011b). ²Hentz first described the species as Tenenaria medicinalis in 1821, the establishment date for the species name. Later, in 1837, Walckenaer placed it in the genus Clubiona, but his position was not accepted by others, and in 1841 he revised the name to Tegenaria nemorensis. Hentz, in 1847, and again in 1867, reasserted his original nomenclature, Tegenaria medicinalis, while Keyserling, in 1887, proposed its placement in the genus Coelotes, with the species name urbanus. In 1898 Simon published a revision placing the species under the genus Coras, giving priority to the specific name established by Hentz in 1821: thus Coras medicinalis. Emerton (1902), as previously noted, described the species as Tegenaria (Cælotes) medicinalis, implying that the generic placement was in dispute, and that he was unaware of Simon’s 1898 revision. Comstock, in 1912, recognized Simon’s 1898 revision as superior, as have other investigators since that date to the present. Kaston (1978) devotes 9½ pages (pp. 164-173) to the Family Agelenidae. Therein he describes the following species, with attribution: (1) Yorima angelica Roth, (2) Cybaeus reticulatus Simon, (3) Cryphoeca montana Emerton, (4) Cicurina brevis Emerton, (5) Cicurina arcuata Keyserling, (6) Cicurina utahana Chamberlin, (7) Cicurana robusta Simon, (8) Agelenopsis pennsylvanica C. L. Koch, (9) Agelenopsis naevia¹ Walckenaer, (10) Agelenopsis aperta Gertsch, (11) Rualena cockerelli Chamberlin & Ivie, (12) Calilena restricta Chamberlin & Ivie, (13) Novalena intermedia Chamberlin & Gertsch, (14) Hololena curta McCook, (15) Hololena hola Chamberlin & Gertsch, (16) Wadotes hybridus Emerton, (17) Wadotes calcaratus Keyserling, (18) Coras medicinalis Hentz, (19) Coras lamellosus Keyserling, (20) Coelotes juvenalis Keyserling, (21) Tegenaria domestica Clerck, (22) Calymmaria cavicola Banks, (23) Calymmaria emertoni Simon, and (24) Calymmaria californica Banks. ¹This species was first described by Walckenaer in 1805. under the species name nævia, nomen nudem. He published a complete description of the species, assigning it to the genus Agelena, in 1841, the formal establishment date for the name. Thorell proposed reassigning it to the genus Agelenopsis in 1877, which proposal was formalized in 1941 (100 years after Walckenaer’s original establishment date) by Chamberlin & Ivie. Gertsch (1979) devotes 4½ pages to the funnel-web weavers (pp. 213-218), noting that the family “includes more than 400 species,” then lists or describes, without attribution, (1) Agelenopsis pennsylvanica, (2) Tegenaria domestica, (3) Tegenaria chiricahuae, (4) Tegenaria agrestis, (5) Tegenaria pagana, (6) Tegenaria gigantia, (7) Tegenaria larva, (8) the genus Calymmaria, (9) the genus Cicurina, (10) the genus Blabomma, (11) the genus Yorima, (12) and the genus Cybaeozyga. He then points out that the Hahniidae family, though distinct from the Agelenidae, is very similar, and that Hahnia cinerea is a member of the Hahniidae family. Gen. Agelenopsis Giebel, 1869: 13 species in North America (Bennett & Ubick, 2005); embolus a conspicuous large open circle, epigynum with coupling cavity on posterior margin (Bennett & Ubick, 2005). Gen. Barronopsis Chamberlin & Ivie, 1941: 4 species in North America (Bennett & Ubick, 2005); embolus in tight spiral coil basally; atrium with deeply notched anterior margin furrow (Bennett & Ubick, 2005). Gen. Calilena Chamberlin & Ivie, 1941: 16 species in North America (Bennett & Ubick, 2005); male palp with RTA (retrolateral apophysis) complex, distal and lateral components occupying most of retrolateral face of palpal tibia; embolus short, simply curved; transparent fulcrum present (may be very small) at base of embolus; genital bulb with medium apophysis and conductor, but lacking conspicuous tegular process; epigynum with slender elongate scape projecting posteriorly from anterior median margin; 2 teeth on retromargin of cheliceral fang furrow (Bennett & Ubick, 2005). Gen. Hololena Chamberlin & Gertsch, 1929: 30 species in North America (Bennett & Ubick, 2005); male palp retrolateral tibial apophysis bipartite with basal component very large and distinctly separate from distal component; embolus sinuous with tip enclosed in transparent fulcrum arising anteriorly from surface of tegulum; epigynum large with atrium broad and divided longitudinally by more-or-less complete ridge and with pair of stout postero-lateral spurs; atrium of some Rualena very similar; 3 teeth on retromargin of cheliceral fang furrow (Bennett & Ubick, 2005). Gen. Melpomene O. P.-Cambridge, 1898: 1 species in North America (Bennett & Ubick, 2005); male palp with retrolateral tibial apophysis simplex, confined to distal half of retrolateral face of palpal tibia; embolus slender, compoundly corved; transparent fulcrum absent; tegular processes well developed; epigynum with anterior hood but lacking slender, elongate scape; 3-4 teeth on retromargin of cheliceral fang furrow (Bennett & Ubick, 2005). Gen. Novalena Chamberlin & Ivie, 1942: 5 species in North America (Bennett & Ubick, 2005); male palp with retrolateral tibial apophysis not clearly bipartite, basal and distal components not distinctly separated; embolus evenly curved, transparent fulcrum absent; epigynum much smaller and lacking broad, medially ridged atrium and postero-lateral spurs; 2-4 teeth on retromargin of cheliceral fang furrow (Bennett & Ubick, 2005). Gen. Rualena Chamberlin & Ivie, 1942: 9 species in North America (Bennett & Ubick, 2005); distinguished by retrolateral tibial apophysis confined to distal half of palpal tibia; epigynum with atrium undivided or only partially divided, and with posterior margin bordered by a thickened ridge; 2-3 teeth on retromargin of cheliceral fang furrow (Bennett & Ubick, 2005). Gen. Tegenaria Latreille, 1804: 6-7 species in North America (Bennett & Ubick, 2005); distinguished by eight eyes in two straight or procurved rows in frontal view, & sternum with contrasting, variable pattern of pale median stripe and lateral spots (Bennett & Ubick, 2005), [and] by the presence of plumose hair on the body and legs (Roth, 1968). Gen. Tortolena Chamberlin & Ivie, 1941: 1 species in North America (Bennett & Ubick, 2005); nearctic male apparently unknown, but embolus probably in form of transverse figure-8; atrium marked by paired ridges spiraling upwards to small copulatory openings (Bennett & Ubick, 2005). Species: Unk. number of species (some est. about 500) worldwide (but see Platnick, 2011), incl. 85 in North America (Bennett & Ubick, 2005). Aitchison, C. W. 1981. Feeding and growth of Coelotes atropos (Araneae, Agelenidae) at low temperatures. J. Arachnol., 9:327-330. Beccaloni, Jan. 2009. Arachnids. University of California Press. Bennett, R. G. 1987. Systematics and natural history of Wadotes (Araneae, Agelenidae). J. Arachnol., 15:91-128. Bennett, Robert G. 1988. The spider genus Cybaeota (Araneae, Agelenidae). J. Arachnol, 16:103-119. Bennett, Robert G. 1989. “Emerit’s glands” in Cybaeota (Araneae, Agelenidae). J. Arachnol., 17:225-235. Bennett, Robert G., and Darrel Ubick. 2005. 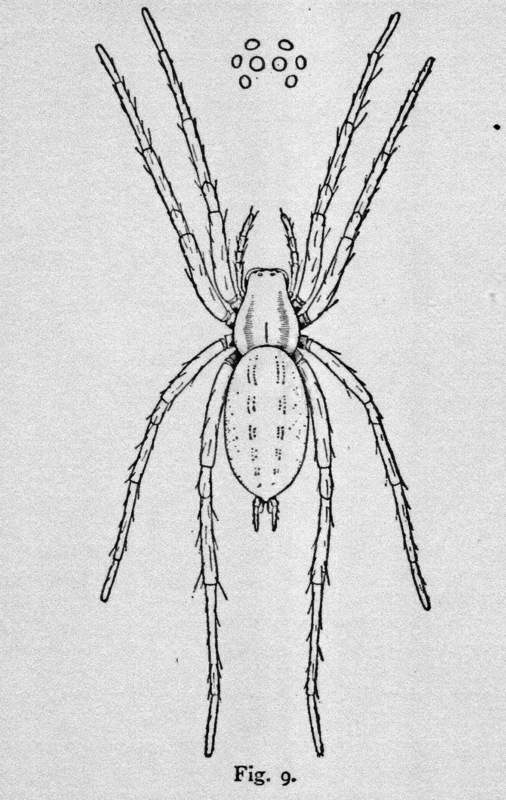 Agelenidae, p. 56-59 in D. Ubick, P. Paquin, P. E. Cushing, and V. Roth (eds.) Spiders of North America: an identification manual. American Arachnological Society. Borradaile, L. A., and F. A. Potts. 1958. The Invertebrata; a manual for the use of students. Cambridge at the University Press. Buchsbaum, Ralph, et al. 1987. Animals Without Backbones, Third Edition. The University of Chicago Press. Bulloch, W. S. 1958. Practical Invertebrate Anatomy. McMillan & Co. Ltd.
Catley, Kefvn M. 1992. Supercooling and its Ecological Implications in Coelotes atrropos (Araneae, Agelenidae). J. Arachnol. 20:58-63. Comstock, John Henry. 1912. The Spider Book. The New Nature Library, Vol. Seven, Part Two. Doubleday, Page & Company. Emerton, James H. 1883. The Structure and Habits of Spiders. S. E. Cassino & Co, Publishers. Emerton, James H. 1902. The Common Spiders of the United States. Dover Publications Inc.
Foelix, Rainer F. 1996. Biology of Spiders, Second Edition. Oxford University Press. Fraser, J. G. 1987. 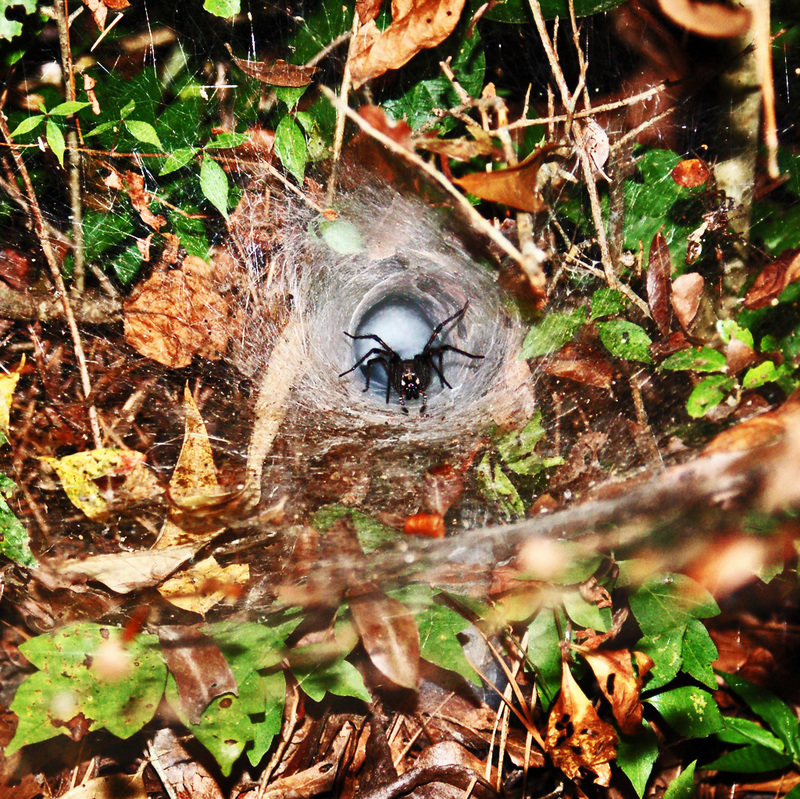 Courtship and copulatory behavior of the funnel-web spider, Hololena adnexa (Araneae, Agelenidae). J. Arachnol., 15:257-262. Gaver, Melissa M., & Laurel D. Hansen. 2005. Efficacy of Insecticides to Control Tegenaria agrestis and Latrodectus hesperus (Araneae: Agelenidae and Theridiidae). Proc. 5th Int. Conf. on Urban Pests. Gertsch, Willis J. 1979. American Spiders, Second Ed. Van Nostrand Reinhold Company. Heiss, John Stabe, and Michael L. Draney. 2004 Revision of the Nearctic Spider Genus Calymmaria (Araneae, Hahniidae). J. Arachnol. 32:457-525. Hillyard, Paul. 1994. The Book of the Spider; from Arachnophobia to the Love of Spiders. Random House Inc., N.Y.
Ibarra N., G. 1985. Egg feeding by Tegenaria spiderlings (Araneae, Agelenidae). J. Arachnol., 13:219- 223. Kaston, B. J. 1978. How to know the spiders. McGraw Hill Company. Koch, Carl Ludwig. 1837. Übersicht des arachnidensystems. Nürnberg,C.H. Zeh [etc.]1837-50. Krafft, B., A. Horel and J .-M. Julita. 1986. Influence of food supply on the duration of the gregarious phase of a maternal-social spider, Coelotes terrestris (Araneae, Agelenidae). J. Arachnol., 14:219-226. Lee, R . E ., Jr . and J . G . Baust . 1985 . Low temperature acclimation in the desert spider, Agelenopsis aperta (Araneae, Agelenidae) . J . Arachnol., 13:129-136. Paquin, Pierre, and Nadine Dupérré. 2003. Guide d’identification des Araignées (Araneae) du Québec. Association des entomologistes amateurs du Québec. Platnick, Norman I. 2011a. The World Spider Catalog, V. 12.0; FAM. AGELENIDAE C. L. Koch, 1837. American Museum of Natural History. Platnick, Norman I. 2011b. The World Spider Catalog, V. 12.0; FAM. CYBAEIDAE Banks, 1892. American Museum of Natural History. Agelena consociata in Equatorial Africa (Araneae, Agelenidae). J. Arachnol., 14:175-191. Roland, C. 1984. 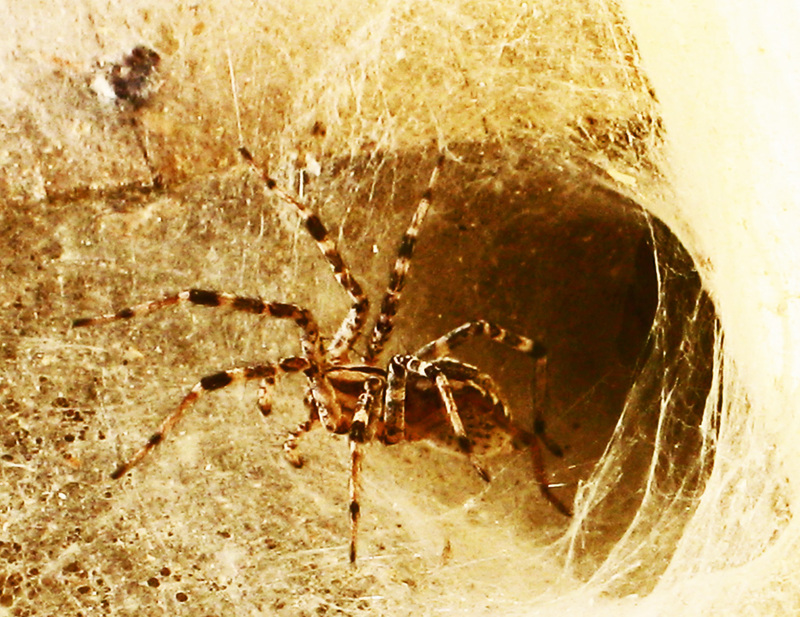 Chemical signals bound to the silk in spider communication (Arachnida, Araneae). J. Arachnol., 11:309-314. Roth, Vincent D. 1968. The Spider Genus Tegenaria in the Western Hemisphere (Agelenidae). American Museum of Natural History, Novitates 2363. Vetter, Richard S. et al. 2003. Distribution of the Medically-implicated Hobo Spider (Araneae: Agelenidae) and a Benign Congener, Tegenaria duellica, in the United States and Canada. J. Med. Entomol. 40(2): 159-164. 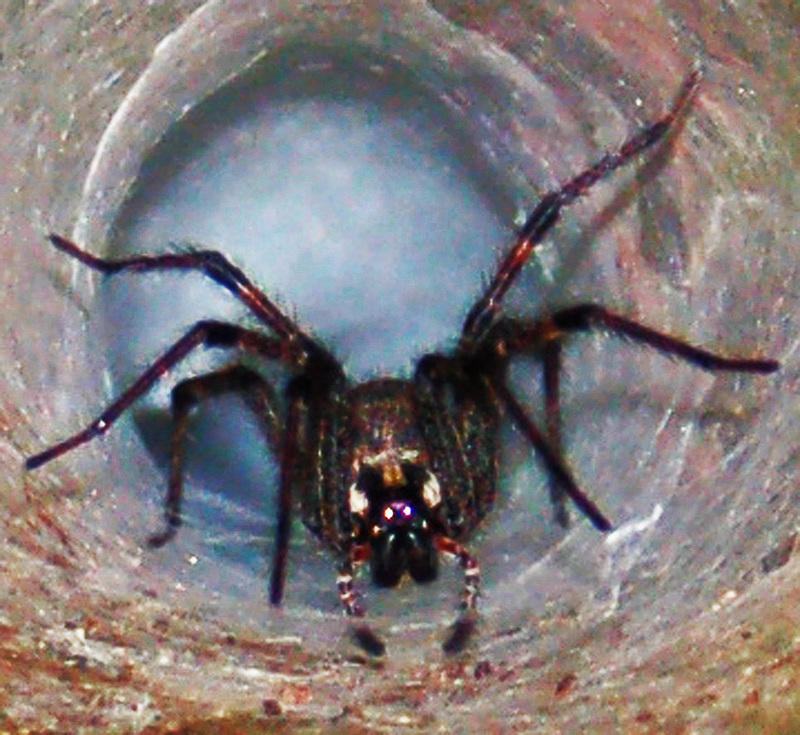 I have pics of an Australian funnel web spider on my front porch. Tell me where to send the pics. I live on the southern edge of the Sam Houston Nat’l Forest. The spider is unmistakable. I am just wondering about bugs & spiders in the Sam Houston National Forest. We actually live in the forest & walk our dogs on the trails daily. 1 of our dogs seems to get @ least 1 tick on her everyday since the temps have gotten cooler. Oddly enough we never found ticks on them in the hotter months. Today when walking we saw many webs on the ground. I am wondering if the builders of the webs are harmful? Any info you can give me is much appreciated. I also have identified by picture a sydney funnel web spider that I found on my front porch after some large oak trees were trimmed in the front yard. The 1 1/4″ black shiny body with large grey abdomen are unmistakeable. it appears to have straight fangs as well, but dont want to get too close. It is not the least bit scared of me, but likes to rear up in front. He(she) matches the pictures perfectly. It would be nice to know if the picture on the web shiny black with grep abdomen on a tree is mislabled. The picture is an exact match for my spider. Send me a photo via email at entomobiotics@gmail.com and I’ll go from there.